Take This Lollipop is an online interactive film that has been around since 2010 and I have used it time and time again both back in the UK in a youth work setting, and in my ESL teaching here in Thailand. 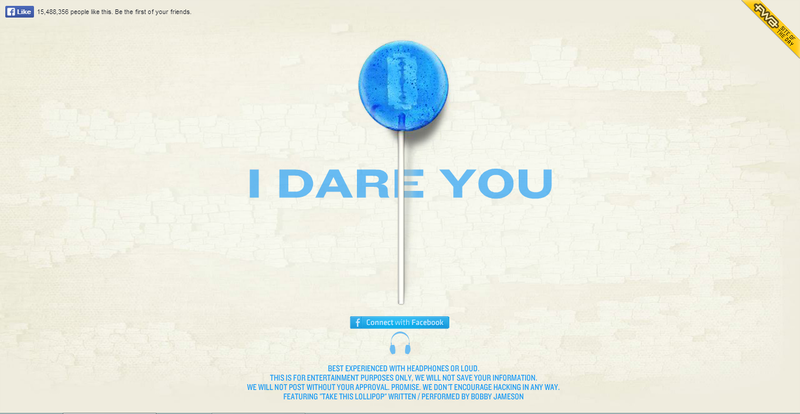 Once of the units I needed to cover with one of my classes last year was Internet Safety – an important topic to explore with young people – and I used Take This Lollipop as a way of introducing the concept of privacy and protection on the internet. The way it works is that someone has to log in using their facebook on the homescreen at takethislollipop.com – remember, this resource was created to highlight the importance of protecting your information on the internet so they don’t save any of the log in details once the activity is complete. Once logged in, the film starts. We see a creepy man sat at a computer surfing the net. He starts checking out facebook and hey, who’s that? It’s the profile of whoever logged in at the beginning. He starts ‘facebook stalking’ the profile and starts behaving quite disturbingly. Photographs of the facebook user and their friends start to show up – it really freaks out the students to see this horrible man looking at pictures of them. Depending on how much information the facebook user has on their profile, the creepy man looks up their address and used google maps to see the street. If the student hasn’t listed an address it will only zoom into their hometown – but if they have written their whole address on their profile it will zoom right in on their street. The film ends as the creepy guy drives off in his car with the facebook users’ profile picture taped to the dashboard. This interactive online film is excellent for starting discussion on internet safety, information protection and privacy. It also helps to highlight how important it is that we think about how much personal information we choose to share on social networking sites. Have a go at home with your own facebook first and see how much it freaks you out! There is a whole range of ‘… in Britain’ videos on YouTube that, although a little dated, are perfect for use in the ESL classroom. I found that the level of language was perfect for my students, and the options for what you can do with the videos is endless. Most of them are subtitled too which really helps the students to follow. In this particular video, Food in Britain, we are taken on a culinary tour of traditional British food. The students found it really interesting and it generated a lot of questions. 1) What can be delivered to people’s houses in the morning? 2) What is the morning meal called? 3) What is in a traditional English breakfast? 4) What do people eat for lunch? 5) Where do most people buy their food from? 6) How do you cook convenience food? 7) What is the evening meal called? 8) What other types of food can be eaten in restaurants? 9) What don’t vegetarians eat? 10) What traditional food is eaten with chips? looking at recipes or even trying to cook! It’s high time I started sharing some of the things I use in my classroom again. This video has been a firm favourite of mine when teaching within the topic of countries – I especially like playing it to the students and then tricking them into thinking we have a pop quiz on how many country names they can remember! Some of the countries are out of date but it’s just a bit of fun and it’s handy to highlight just how many countries there are – many of my students are unaware of the countries outside of S E Asia and it’s always a beneficial lesson to help them to realise how big the world really is. The students really enjoyed looking out for when Yakko sings the name of their country and all gave a big whoop when he did. Just something fun to introduce a bit of a dry topic. EDIT: I’ve just been informed that the video missed out South Africa! Are there any more glaring omissions? Looking for Halloween lesson ideas? Click here! In the previous lesson I introduced the concept of onomatopoeia and we looked at examples of sound words and their uses. In this lesson I wanted the students to apply the new words that they had learned. To start the lesson I played the audio only of the video below. I didn’t tell them any information about the video, just asking them to listen carefully and think about what they can hear. We listened to it another time, and this time I encouraged the students to think about what sound words could be used to describe the sounds we could hear. We then listened for a third and final time, followed by a brainstorm on the board about what the students thought they could hear. After a good discussion about the sounds that we could hear and what they might be, I finally played the video on the projector screen for all to see. The students were really excited to find out what the sounds were and they were surprised to find that they were all different types of fireworks. As we watched the video I pointed out the different sound words as they appeared. 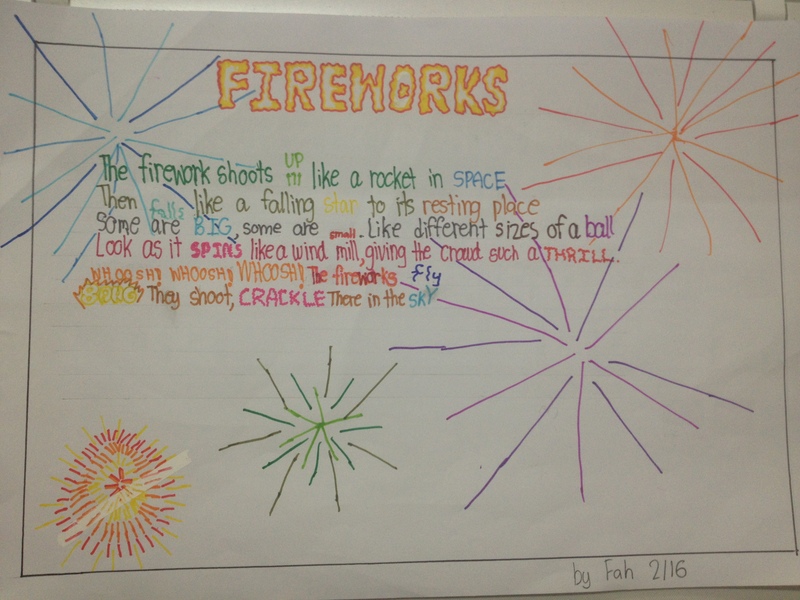 I then handed out this worksheet where students needed to think about sound words (onomatopoeia), action words (verbs) and adjectives that could be used to describe the fireworks in the video. Fireworks are (action) and (action) in the night sky. (Adjective) fireworks (sound) and (sound). Fireworks (sound), (action) and (action). (Adjective) fireworks (sound –ing) and (sound-ing). 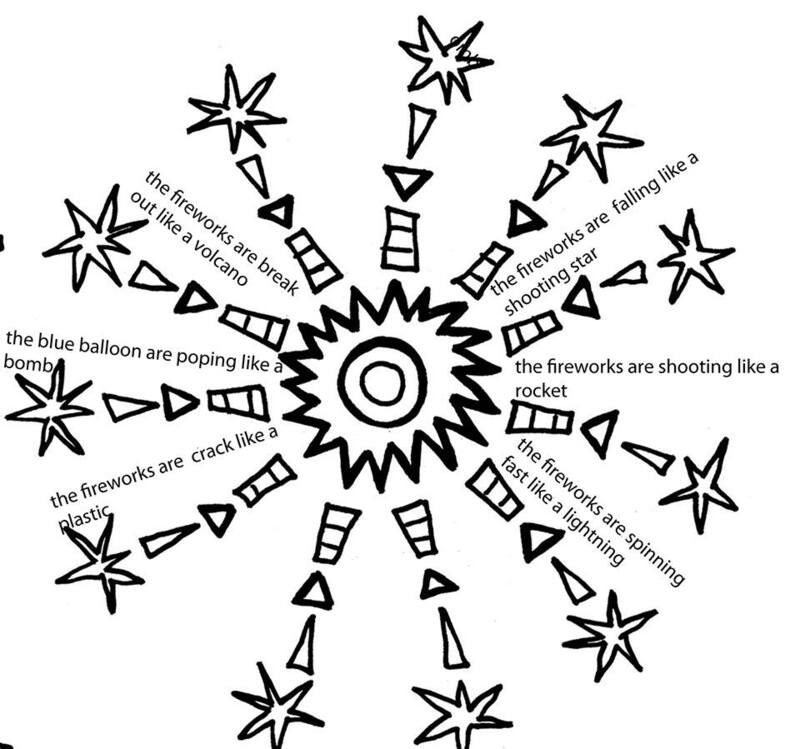 Using examples on google images, I asked the students to use their sentences to create a fireworks shape poem for homework. Here are some examples of the work that I received the following lesson. This one in particular impressed me as the student had created rhymes and a good rhythm which I hadn’t asked for. Although it wasn’t strictly a shape poem…! I have a lot more that I want to take some pictures of but I went and gave them back to the students before I had thought about getting a few snaps! Hopefully I will be able to add them at a later date as there was some really impressive work. This was a really fun couple of lessons covering a subject that an ESL teacher usually wouldn’t have included in their curricculum – the beauty of being left to my own devices. Some people find the thought of teaching creative writing a bit daunting but hopefully this goes to show that if you simplify and break down the process you can have entire classes of students creating wonderful pieces of writing! This is the second lesson of two that I taught within the topic of onomatopoeia. If you would like to check out the first lesson, click here.